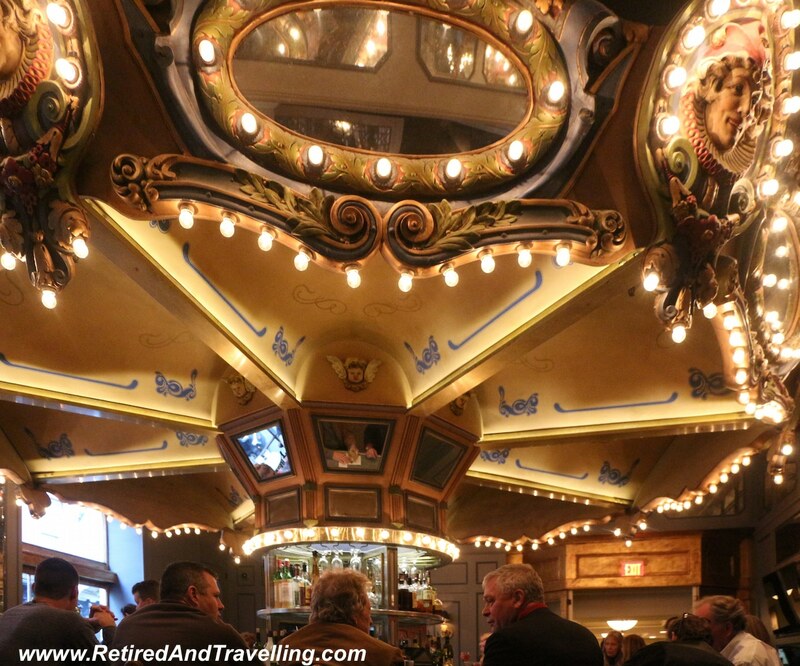 We were in New Orleans for 8 days so we had lots of time to try a variety of places to eat. But it was Mardi Gras and everyone was looking for places to eat, so many times the line ups defeated our desire to try certain places. Many places went back on the list for a return visit but we were able to create quite a list for our wimp guide to eating in New Orleans! I will preamble this list by explaining that we are both spice wimps – salt and pepper are spice to us! So the thought of being in a city known for its Creole cooking (read – “hot and spicy”) had me kinda scared. As a huge seafood fan, David will often be brave as long as the dish has seafood in it. He also is more adventurous and seeks out local specialties, whether it is beer, wine or food. 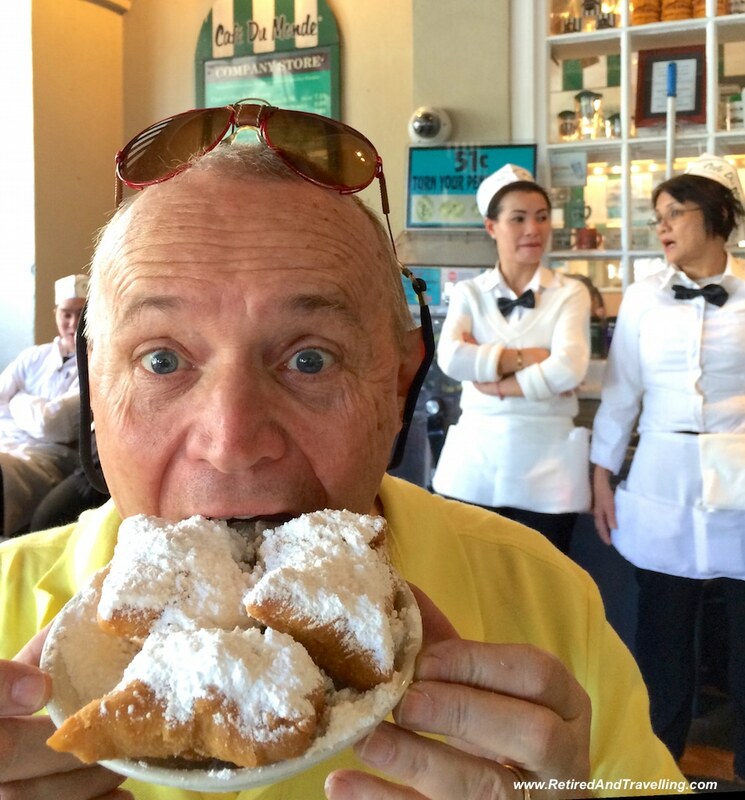 So this may be considered to be a wimp guide to eating in New Orleans! Since our hotel had a limited repetitive continental breakfast, we would head out several times for a more substantial protein breakfast. Lunch was generally our big meal of the day. After walking for hours, we would need a longer stop to rest and fuel back up. Most evenings we got drawn into our evening plans without dinner or were far too exhausted to head back out to eat. So we did not really go out for a special evening meal, even though we had a few places picked out. This may not be the “top” list of places to eat but you can see how we ate our way through New Orleans …. Directions to a coffee shop was one of the first things that we asked our hotel concierge for. When an immediate answer was not forthcoming, we knew we might be in trouble. They went on to explain that New Orleans was more of a bar culture than a cafe culture. They then proceeded to Google us a spot! We only found two Starbucks in the entire time we were in New Orleans! But we did manage to find good coffee and great sweet snacks when we went searching. As confessed chocoholics and caramel addicts, we could always find something sweet to offset any spice that snuck through our defences – but coffee spots still ended up on our wimp guide to eating in New Orleans! CeCe’s was the coffee house in the French Quarter on Royal Street that we were directed to by our hotel concierge. Later when we were travelling we saw another one on Esplanade in this local small chain. The coffee was “pulled” on an espresso machine and I could even get mine iced. We logged into the wifi to share our early NOLA pics and enjoyed coffee and a muffin. After finishing our stroll around the New Orleans Museum of Art Outdoor Sculpture Garden we headed off in search of coffee and a rest. We considered the Morning Call cafe in the park by the river but were told that the coffee at the Cafe NOMA was better. Inside the museum, it was almost lunch time and it smelled delicious – so we could just follow our nose. We debated having something off the great lunch menu but looking at the selection of muffins, cakes and specialty coffees, we finally decided we would just have a snack. 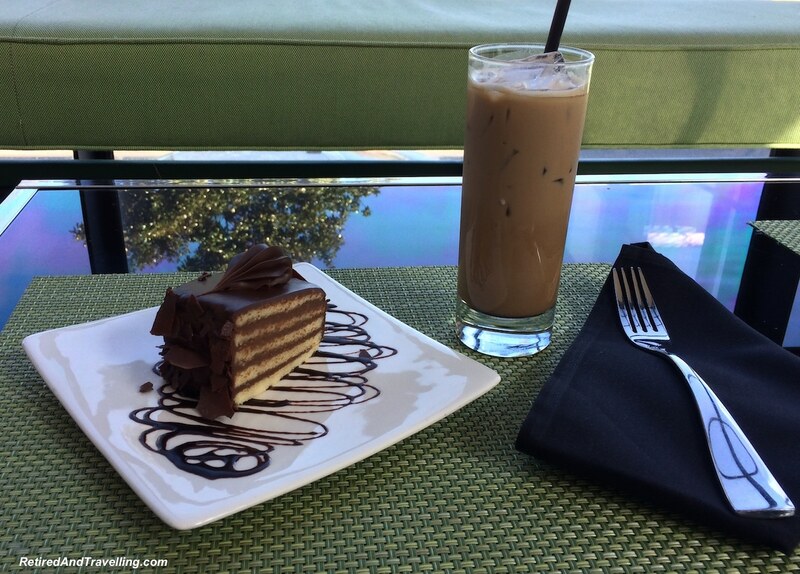 Taking our specialty coffees (one caramel latte and one iced mocha) with a local Chocolate Doberge cake, we found a comfortable spot on the sofa by a large picture window. Many of the places we did try came as great suggestions from our hostess. 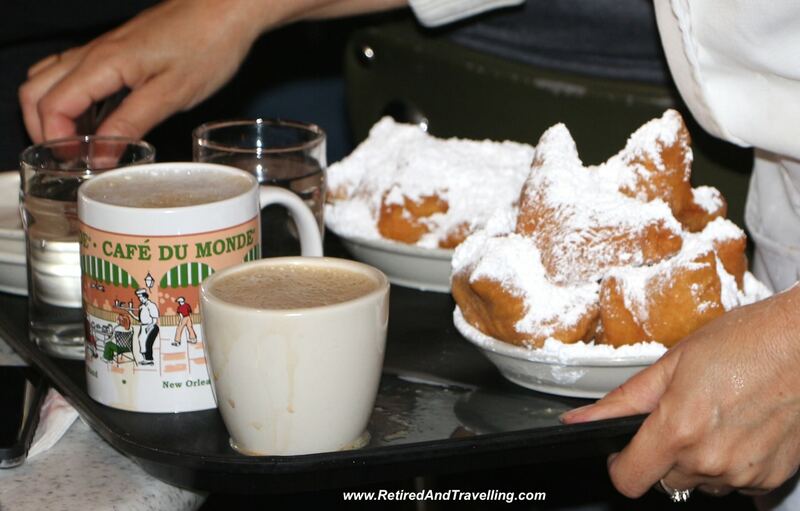 It may be cliché but everyone should visit Cafe du Monde at least once! They opened their doors in the early 1860’s and continue to operate 24 hours a day all year round. 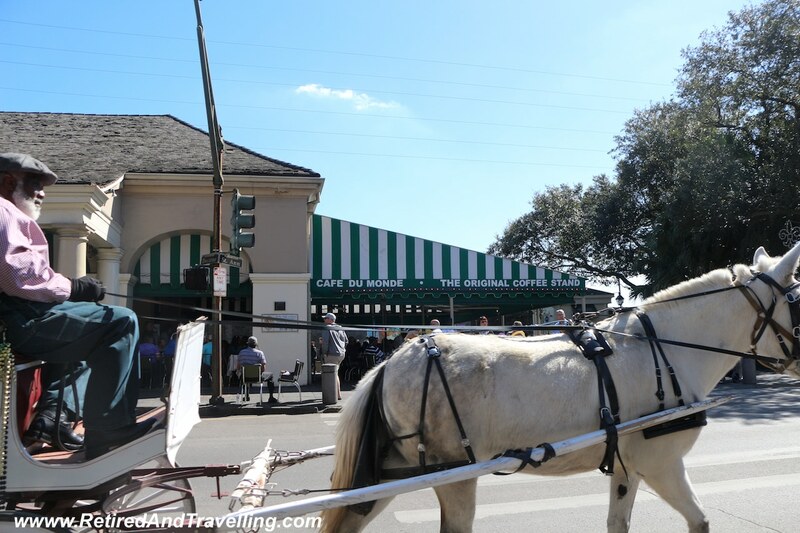 While we had headed for there early in the morning, a slow meandering walk through the French Market put us at Cafe du Monde in the early afternoon on the Friday of Mardi Gras. Not a table was to be had and the line up for take out was long. We tried again when we were exhausted after the parades on Fat Tuesday and again found the “tourists” lined out the door. Luckily we were staying to enjoy New Orleans after the party, so we managed to wander in when there was no wait for a table. The place was packed but I think that is part of the atmosphere you go for. Iced cafe latte and a plate of beignets and we were in heaven. Just try not to snort the white powder sugar when you are trying to lick that plate clean! 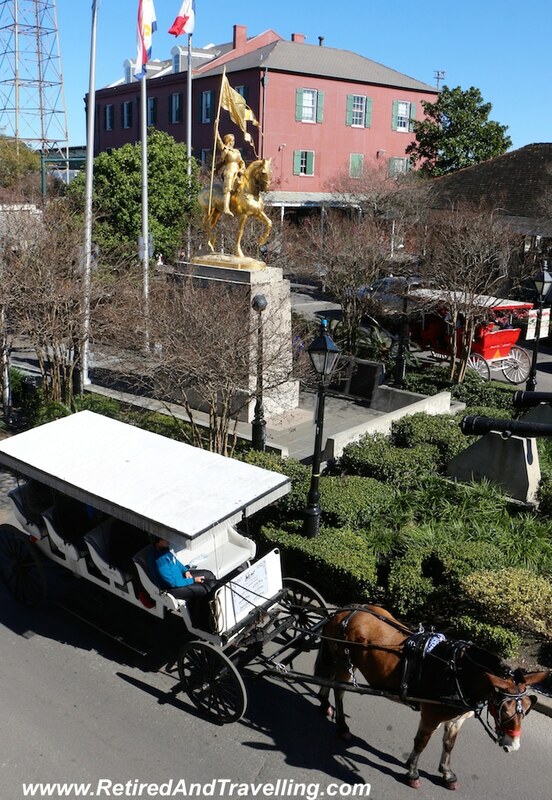 One day we took the St. Charles streetcar out as far as Oak Street and just walked around. Our waitress at Ruby Slipper (see below) had suggested that this was an up and coming neighbourhood. 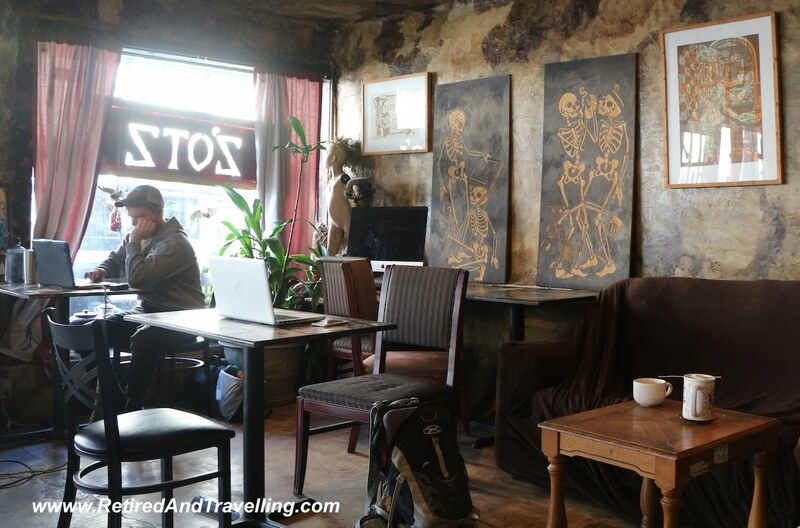 Z’otz Cafe looked like just our kind of local coffee shop. We could get our coffee hot or strong and it all started from the espresso machine. If you are not from the south, I imagine when I say “praline”, you think of sugar covered nuts (generally pecans) that are often found in pie or ice cream. When I first went in search of “pralines” in New Orleans, I thought I would find a bag of nuts. What I found instead was a sweet creamy treat that was like soft fudge. Some of the pralines had nuts in them but not all. We found pralines with peanut butter, chocolate and salted caramel. French settlers originally brought the praline recipe to Louisiana, where both sugar cane and pecan trees were plentiful. In New Orleans the traditional French treat evolved as chefs substituted pecans for almonds, added cream to thicken the confection, and thus created what became known throughout the American South as the praline. 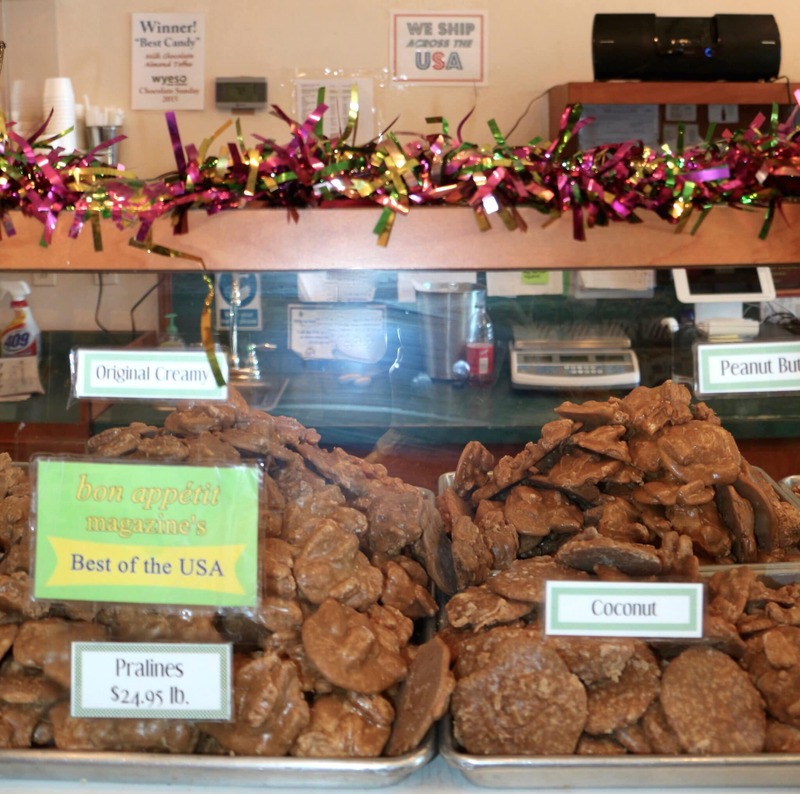 If you wander around New Orleans, you will find dozens of stores that claim they sell the “original” pralines. I am not sure we ever learned who the “original” maker was. 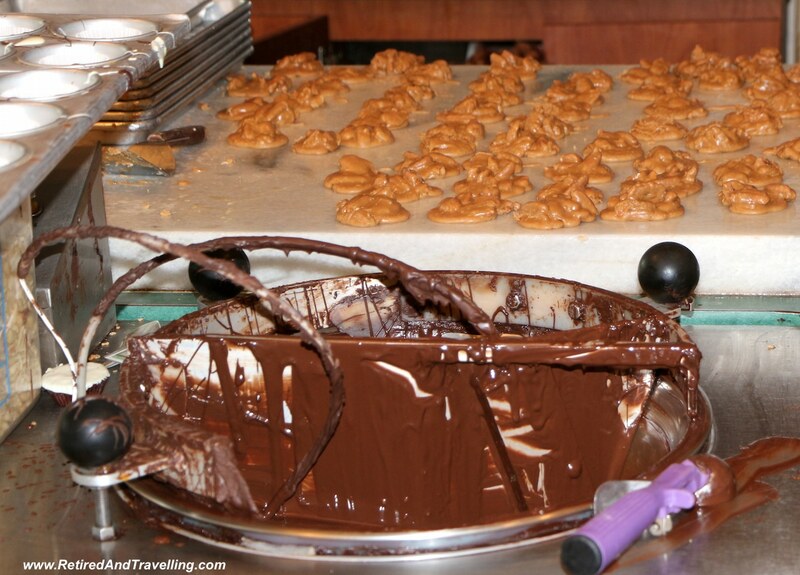 We watched the pralines being made while David drooled as the chocolate was being melted. We did try several different versions – just for the research of course – and did bring home a selection as gifts. While we normally do not bring home many souvenirs, we will bring home local food and drink specialties if we really want to share (chocolate from Grenada, coffee from Puerto Rico, Limoncello from Amalfi Coast and Rum Cake from The Bahamas). One of our favourite spots was the New Orleans Southern Candy Makers. The owner seemed to have a special liking for Canadians and was up for playful banter while we filled our box with goodies. They offered a broad range of fresh selections, home made ice cream and a great variety of pre-packaged products to take home. We knew that anything we got in a take out bag would never make it home! It was great that our hotel offered “free” breakfasts but not so great that it was the same thing every day, there was not a scrap of protein on the platter and on the weekend no fresh supplies came in and the croissants could be used as a baseball! We are both breakfast people so after coffee and a small snack at the hotel it would not be long before we went looking for breakfast. In North America, you know you can always find at least the “Basic Breakfast” – eggs, bacon/ham/sausage and toast. 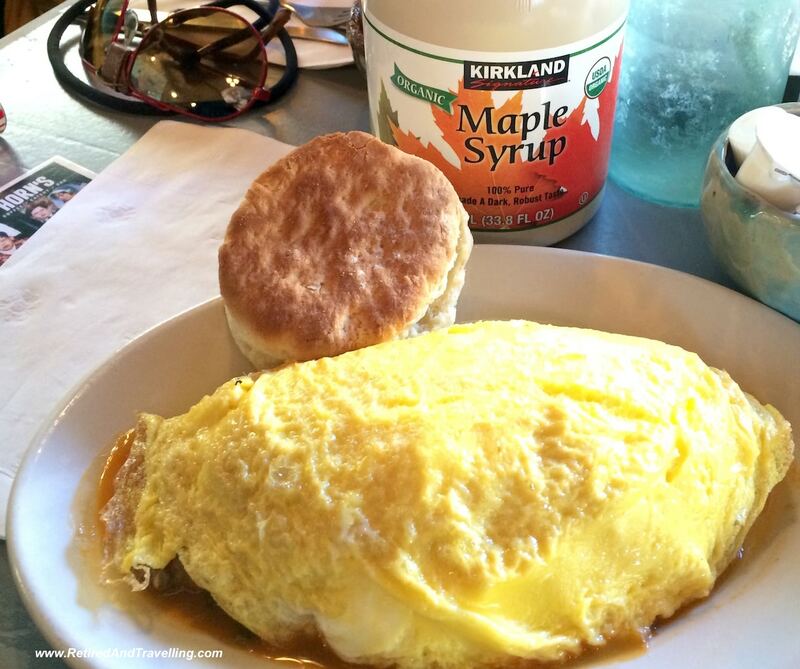 For a wimp guide to eating in New Orleans, it was easy to find breakfast spots to put on the list. While you could stay safe and order the Basic Breakfast, many times we were tempted by both sweet and savoury options that we far more delicious that staying at the entry wimp level. Horn’s was an easy walk into the Marigny district from our hotel and we visited there regularly during our stay for breakfast. It was evident as soon as we entered early in the morning that this was a breakfast spot for locals. It was also obvious when we walked in that seafood was on the breakfast menu. On our first visit, David had the Bon Ton omelette (with crawfish étouffée) while I settled for pancakes (the “Doc Horn”). We were pleasantly surprised to find they have real maple syrup from Quebec (dark, Grade A) and also a low glycemic index agave syrup. Breakfast portions were large. Over several visits, we ultimately tried a traditional 3 egg breakfast, Eggs Benedict off the Brunch Menu on Fat Tuesday and a fully loaded omelette. If you are staying in the Marigny district, don’t miss this local spot. There are 3 Ruby Slipper locations in New Orleans. We tried a couple of times to get into the one on Canal Street but since that was in the midst of Mardi Gras madness, the lines were always more than we could bear. Luckily for us there was one a few blocks away from our hotel in the Marigny district. Once we were past Fat Tuesday, the line ups dropped to a reasonable level and we were able to drop in for breakfast without using their online app to pre-book a table. I knew we were in for trouble when the specials all included chocolate and David could not resist the double chocolate pancakes. 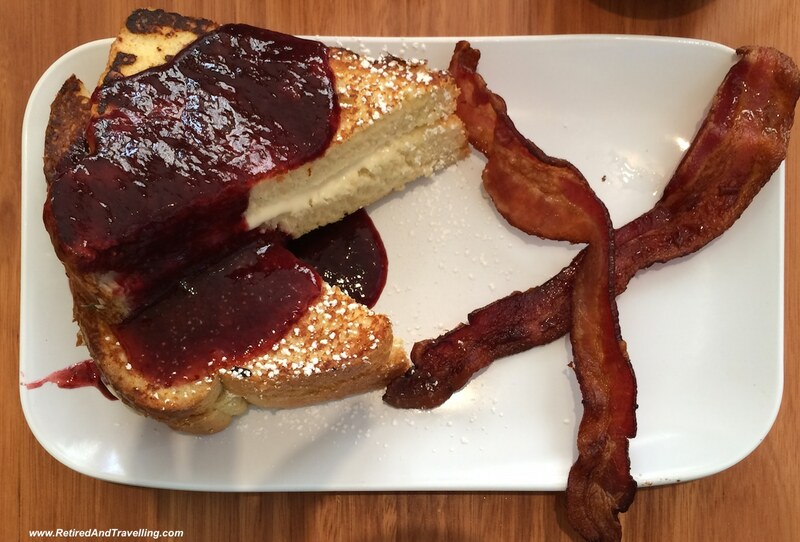 Although I had gone in looking for a heavy protein breakfast to fuel my day, I could not resist the French Toast with cheesecake in the middle and fresh berry compote on top. It was delicious and much lighter than I expected! A great breakfast find. We had an awesome waitress who epitomized customer service excellence and what it meant to truly love being in the service business. She was attentive, gave great input on menu selections and as a great New Orleans ambassador gave us suggestions on where we might eat when we headed out to other parts of the city. We found Buffa’s right beside our hotel. The front part is a bar and the back part is a local restaurant that is open for breakfast through to late night snacks. We ate at Buffa’s several times when we just couldn’t go any further from home. The breakfast menu will provide a solid protein fix, they had a special brunch menu and the regular menu contained good basic bar food with some local delicacies. On our first visit, David was more adventurous and tried the Fried Gator Balls but had to ask what the etiquette was to eat them. I picked my way around the spicy options but even so ended up with blackened steak in my sandwich (blackened is with spice) and even the fries had spice on them. Good thing that David ordered a local beer to help wash it down. 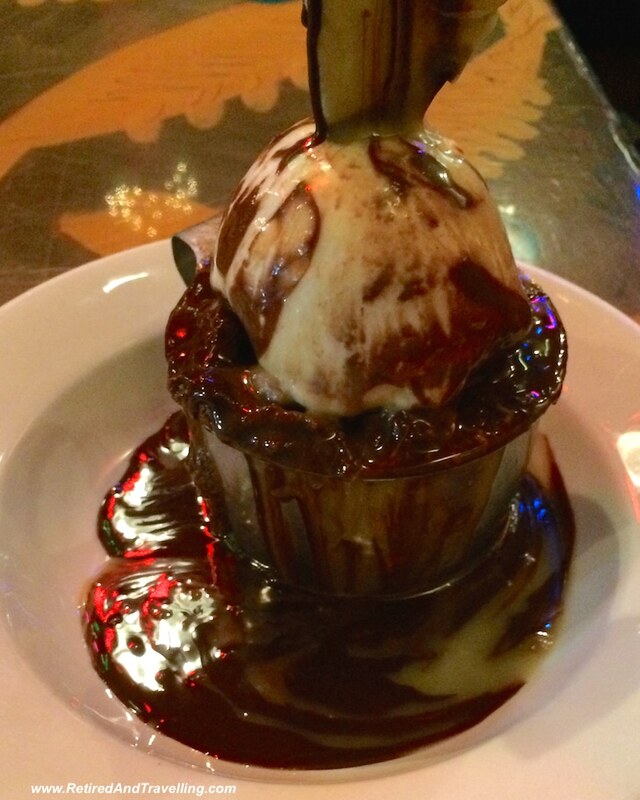 We didn’t start out very good on our wimp guide to eating in New Orleans! Our choices on return visits stayed with more simple salad and sandwich choices. The desserts became a big draw but the one night we went in looking for takeout dessert, the shelf had already been cleared out. 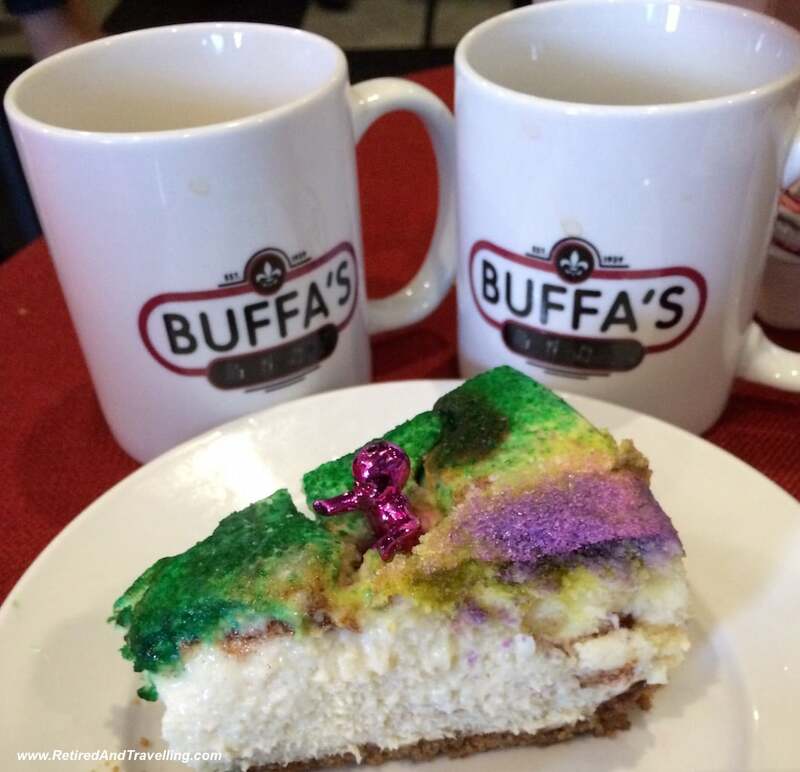 David was drawn to the chocolate espresso cheese cake but I asked for the Mardi Gras favourite King Cake Cheesecake. We would later learn that “King Cake” referred to almost any kind of cake that was decorated in Mardi Gras colours – green, purple and gold. This cheesecake was a particularly delicious King Cake, made extra special when I got the “baby” on my piece of cake (one per cake). The baby symbolizes luck and prosperity to whoever finds it in his/her slice of cake. In some traditions, the finder of the baby is designated “king” or “queen” for the evening. Much to David’s dismay, I continue to have the baby tied to the string of my sunglasses. My luck was so bad the previous year that I was taking any charm I could to improve things. Surprisingly, the restaurant and not the bar is also where the action happens! 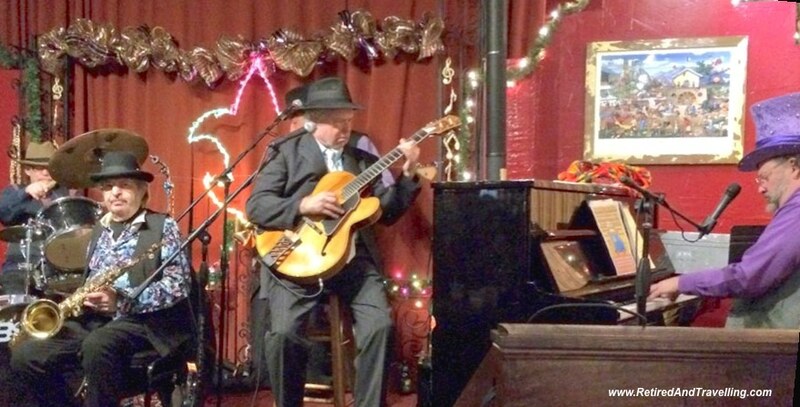 Buffa’s had something different in jazz every day we were there. One night we witnessed the guest performer list fill up in about 30 minutes for open mike night. We saw a wide range of performers, many of whom seemed to have local fans who swayed and sang as the band played. After finishing our stroll around the New Orleans Museum of Art Outdoor Sculpture Garden we headed down Esplanade Street looking for Lola’s for home made Sangria and some lunch. It was on David’s “list”. Unfortunately Lola’s was not open for lunch but luckily we could see Santa Fe Restaurant across the street. We had spent the morning walking around the French Market and needed to find a spot for lunch. We got pulled into Frank’s Restaurant from the street with an offer of a seat in the upper balcony with a view. With an edge seat we could look out over the French Market and the sparkling gold statue of Joan of Arc (also called the Maid of Orleans). Several times we saw a long string of farm tractors roll by. 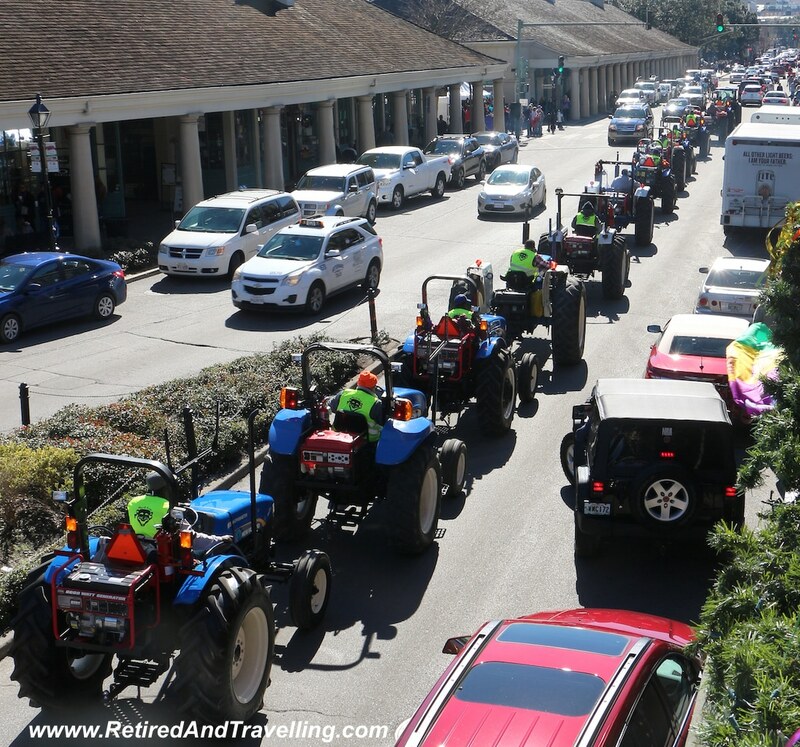 We assumed they were on their way to get set up with that day’s Mardi Gras parades. 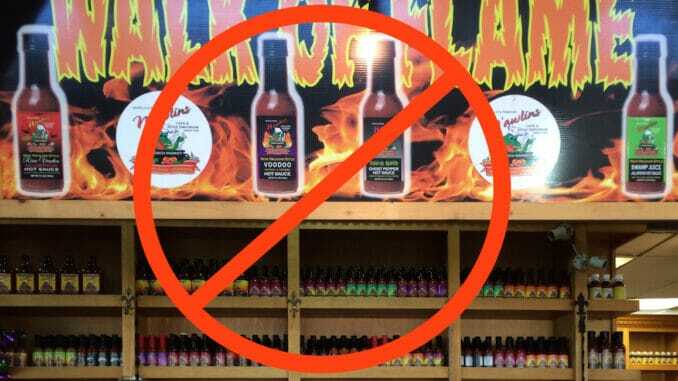 For those following the wimp guide to eating in New Orleans, we were happy to find there was nothing spicy on the menu. With a traditional Italian menu it was easy to find something for our lunch break. David debated having an authentic muffalettas sandwich but the olives turned him off. He did eventually try one of these later in the week when he had a quick lunch at the Market Cafe and found the olive taste to be quite mild. When we were at Cafe NOMA, Suzie, one of the staff suggested that we go to Red Fish Grill for the famed double chocolate bread pudding. David the chocoholic had that on his list for sure. One night after we had survived the walk along Bourbon we stopped in for coffee and desert. 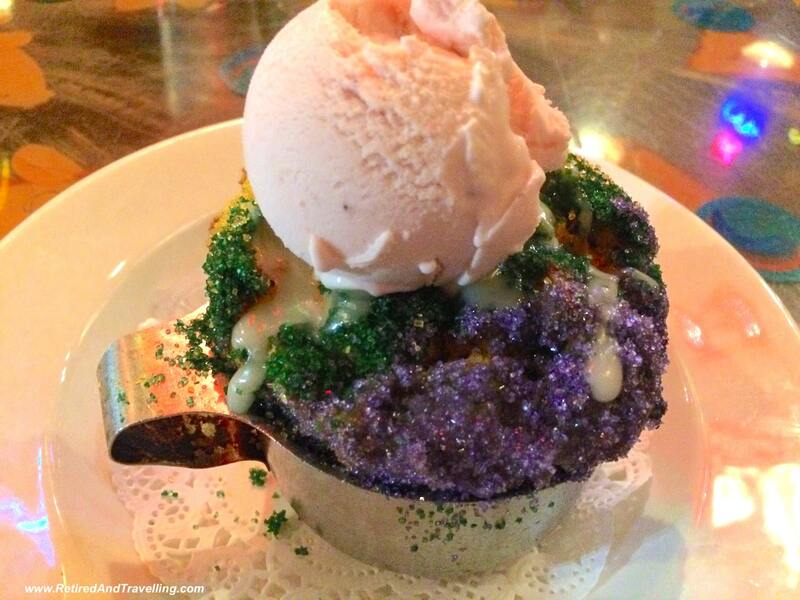 While the double chocolate bread pudding lived up to its billing, I found the King Cake bread pudding to be much less tasty than the King Cake cheesecake I had a few days prior at Buffa’s. And I didn’t get a second baby! The menu had a great selection of varied seafood so David kept hoping to get another chance to visit. We never did make it back for a real seafood dinner but this will be on our list for when we return. We found the New Orleans Seafood and Hamburger restaurant in the French Quarter but we did later see that this was a chain with other locations in New Orleans and around Louisiana. The French Quarter location was another of the spots we tried more than once before we finally got in. The menu included a full story about the history of flat fried catfish. 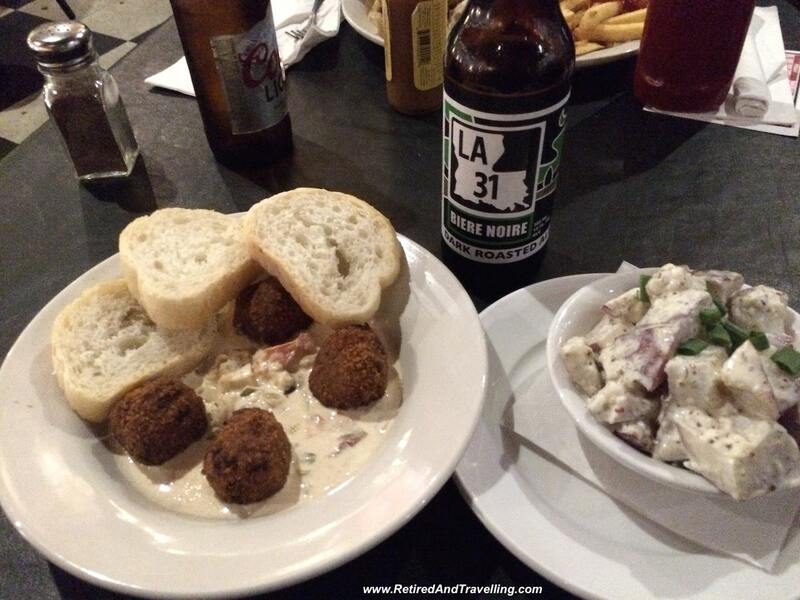 After checking to gauge the “spice level”, David couldn’t resist catfish in a Triple Sampler (Thin Fried Catfish, Boudin Balls and Alligator Poppers). The light batter made the catfish tasty but he was not so sure about the taste or consistency of the other two delicacies. I was craving vegetables and was delighted with my Strawberry Fields Salad with grilled chicken, strawberries and honey glazed pecans. Both of these fulfilled all requirements for a wimp guide to eating in New Orleans. If you take the St. Charles streetcar into uptown, you can get off the streetcar as it turns onto Carrolton. We had been looking for Cooter Browns Tavern and Oyster Bar as recommended by the waitress at the Ruby Slipper but hunger won out before we found it. If you do go looking, it is diagonally across from the streetcar stop in behind the New Orleans Original Daiquiri Bar. When we had been on the streetcar, the people sitting behind me were talking about La Madeline, so when we found it right at the streetcar stop, it was an easy choice. It has French cafe style food in a self-serve model. You order from the counter and take a seat. Nothing on this french menu looked like it would not meet the wimp guide to eating in New Orleans. While we bypassed the fresh French pastries at the dessert counter, they all looked very tempting. They had a great broad selection of salads and I was able to find the spinach, strawberry and pecan salad that I was craving. David’s Croque Monsieur sandwich was piping hot and tasty – but big – so consider sharing. While the pre-cooked specials of the day looked fine, sitting down for lunch well after 2pm we were happier ordering items that would be cooked fresh. La Madeline is a chain so you might find one where you stay in New Orleans. We lost track of all the places we stopped to eat as we wandered New Orleans. David did try to order local whenever he could. While we couldn’t get a clear answer as to whether crawfish was actually in season when we were there, he made sure to try crawfish mac and cheese and a crawfish breakfast omelette. Gator was available in a surprising number of places include the food stalls at the French Market. There was also a very wide selection of foods that started with “Creole …” that both of us generally needed to avoid on this wimp guide to eating in New Orleans. The Carousel Bar was high on my list of things to do. It is just off the lobby in the hotel. While much of the lounge looks like a typical hotel lobby bar, the star attraction is the rotating bar with stools that is designed as a true carousel that rotates. Needless to say, this attraction was high on everyone’s list and people were standing two deep trying to get a seat at the rotating bar. David was not that in need of a cocktail to wait for hours for his seat. There was a stretch of restaurants and bars on Frenchman Street in the Marigny district close to where we were staying. It was on our plan to wander that way for dinner and some jazz but never made it out that way at night. Adolpho’s serves Italian fare with Cajun-Creole flair in a quaint, small setting. We had wanted to try this for a romantic night dinner treat on our last night but we were again too exhausted when we arrived home. The other suggestion I got on Twitter was to try Feelings Cafe for a romantic dinner. Romance will certainly be on the agenda for a return trip! It was recommended that we try a local drink. A Sazerac drink includes Sazerac rye whiskey, Herbsaint and Peychauds Bitters. While we did find it on the menu a few times, we never ordered it. When we spent the fall in Vancouver, we got spoiled with the variety of food trucks in the city and the great food we could get. We were not sure if it was just because of Mardi Gras, but we found food trucks on major street corners by the parade route. We didn’t stop for food but there did appear to be quite a range of offerings. 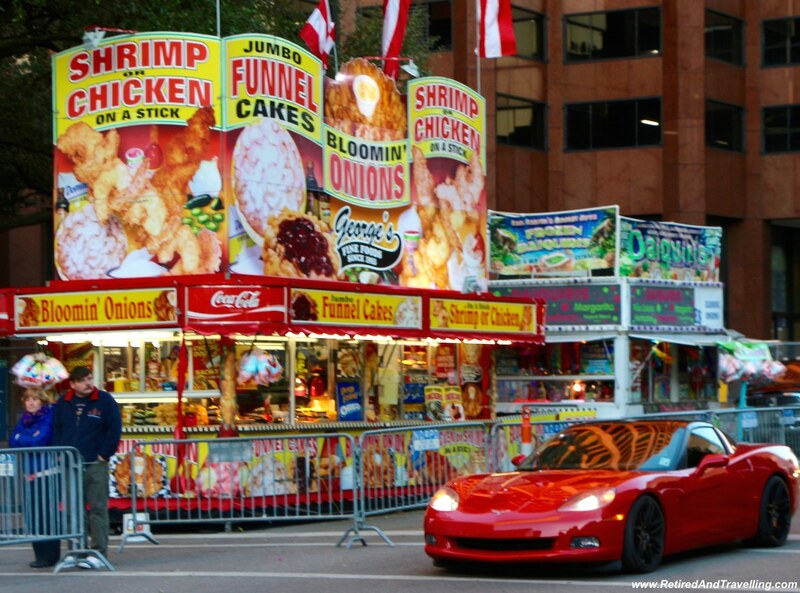 We were often uncertain whether the food truck specialities would pass the wimp guide to eating in New Orleans. 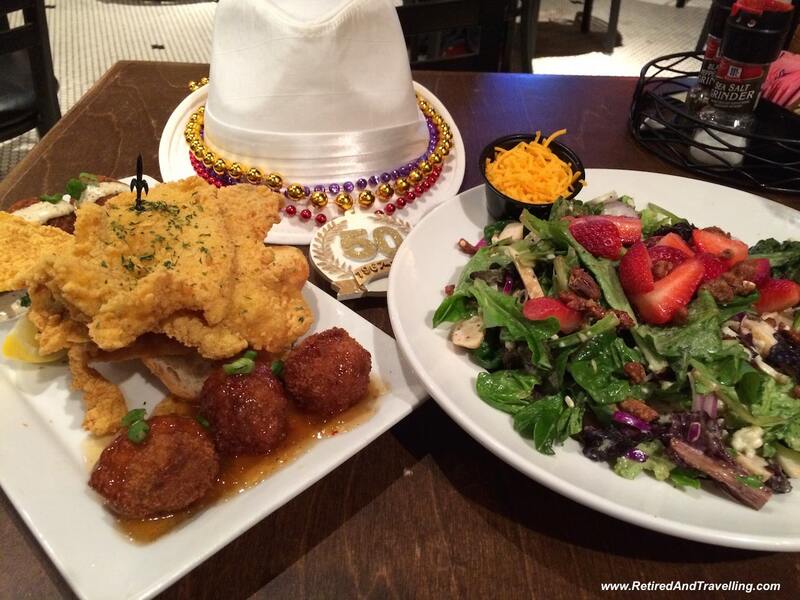 There is a lot to do in New Orleans and trying new local food is high on the list. We ate well while in New Orleans for 8 days, even if we did stick to the wimp guide to eating in New Orleans. David managed to find seafood almost every time we went out. As usual when we were travelling, we had far too few fruits and vegetables. David did well at eating some local specialties washed down with local beers. 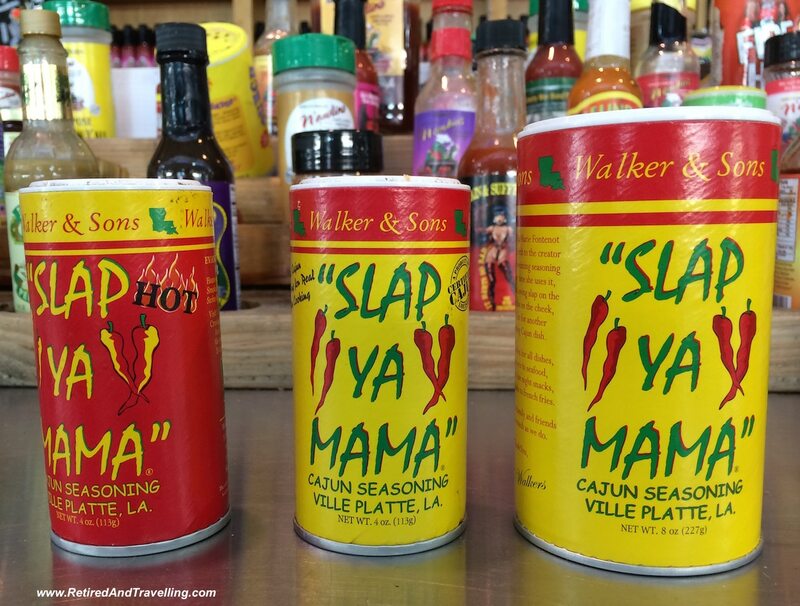 What is the one thing on your wimp guide to eating in New Orleans that we missed? If we got adventurous, what local food should we have tried? What is your top choice for a great romantic dinner spot if we go back and actually take time out for a nice evening meal? It looks like you ate well! Everything looks amazing. I would love to go to New Orleans sometime and just eat everything. I looked this up. The jazz brunch sounds like a great idea. Thanks for adding to our return eating list!